It is often difficult to orally administer the correct amount of medicine to children accurately and safely. Young patients refuse the medicines because many of them are bitter tasting. A leading pharmaceutical company has developed a new way of administering drugs to solve the problem, known as multi-particulate drugs. Multi-particulate drugs are tiny spheres, measuring between 0.1 and 0.6 millimeters, with a protective coating. The coating neutralizes the taste of the actual active ingredient without impairing its effectiveness. This innovation makes the safe treatment of children considerably easier. Together with HS Design from Gladstone, NJ/USA, Röchling Medical has developed the new drug delivery system Sympfiny® specifically for this new way of administering drugs. It allows for simple and reliable administration as well as the exact dosage of the drug. This innovation makes the safe treatment of children considerably easier. Sympfiny® consists of a container for the drug and an accurately fitting oral syringe for drawing and administering the multi-particulate drug. 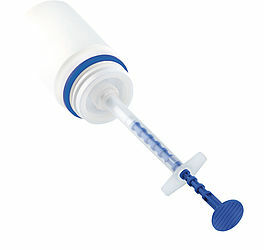 The oral syringe is connected to the container so that the drug can be precisely dosed, drawn and administered. A plastic part in the syringe allows the dosage to be set safely and transparently. This easy handling means the multi-particulate drugs can be administered as precisely and safely as liquid drugs. 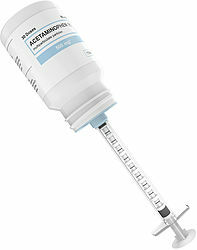 With the oral syringe, users can rely on a trusted and proven system that is standard with liquid drugs.